A clever and unique strategy card drafting game set in an airborne city. 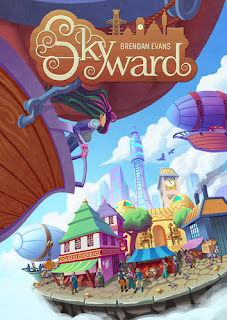 Skyward delivers a good punch for a small box game. 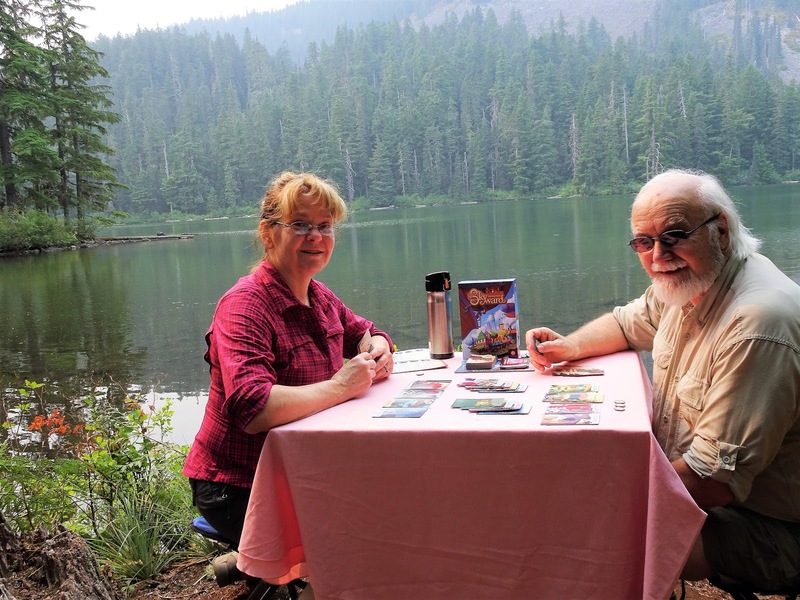 The game features a small board and a good size deck of cards featuring cards from 4 different factions plus a few cards for vehicles and critters. Each faction has a variety of buildings that can be launched with varying points and varying abilities. Each faction’s buildings are unique to their faction. Scoring combinations can even cross faction lines. The premise of the game is four previously warring factions have formed a truce in order to build the first airborne city, Skyward. Players compete in using a combination from the factions to build the highest scoring airspace. A game of Skyward starts by assigning the 1st player, or Warden role for the first round Split phase. The Warden will draw cards, face up, equal to 4 times the number of players. Now the fun begins. The Warden will divide these cards into a number of stacks equal to the number of players. The Warden chooses which cards and how many go into each stack – they do not have to be equally divided. The Warden will place the Warden token on one of the stacks. In turn order and beginning with the player to the Warden’s left, each player will choose one of the stacks of cards to add to their hand. The Warden will get the last remaining stack. Ooh it can make for an interesting dilemma for the Warden when creating the stacks. The player who selects the stack with the Warden token immediately becomes the first player for the Launch phase, receives a cog token, and will be the Warden in the next round. Cog tokens are used as a wild symbol when paying a building’s launch cost. In turn order starting with the new Warden, players can choose a building card from their hand to launch by paying the appropriate faction cost. Additionally, they may discard 3 cards to obtain a wild cog token. There is a hand limit of 6 cards at the end of the turn. After everyone has launched or passed the new, the new Warden begins the next round by drawing and splitting another set of cards. The game ends when the launch deck is exhausted or any player has 6 or more launched buildings in their airspace. The game is all about the card split and the selection of which stack to take. Each faction has cards with strong abilities. The key is to quickly build a powerful combination. This is not a long game. It is likely a player will launch 6 buildings within 6 rounds. We have an open copy of Skyward available in our Demo Games Library for you come in and try.